What would the zombie classic Night of the Living Dead look like as a mash-up of mixed-media scenes from today’s creative visionaries? Night of the Living Dead: Reanimated, a collaboration between 150 artists and animators, attempts to answer the question using sock puppets, oil paintings, CGI, hand-drawn animation, and everything in between. We haven’t seen the full film–Neoflux Productions will release it on DVD in late July–but we can already tell from the previews that the movie lacks any sort of continuity. It’s more like a series of short films riffing on the zombie genre, with contributions from artists including Sean Williams, Grant Fuhst, Zina Lahr, and Anthony Amos. 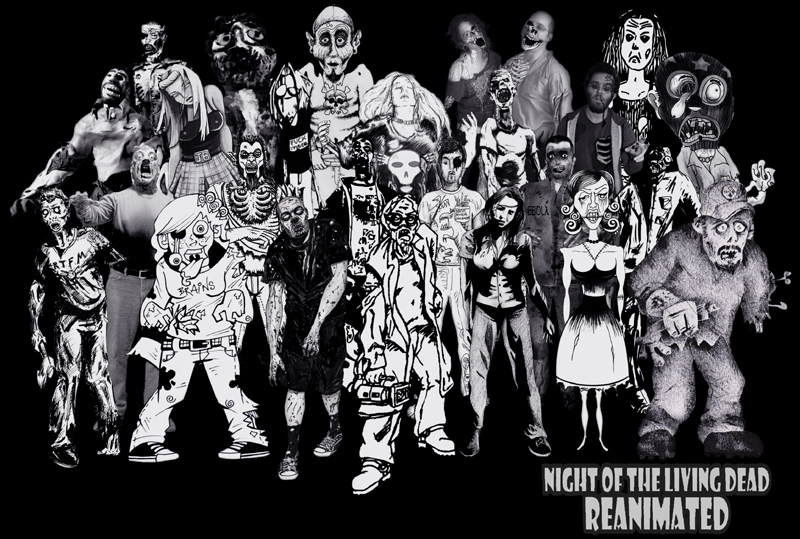 Night of the Living Dead: Reanimated isn’t a one-off film for Neoflux Productions. The production company’s next project, Unseen Horror, will feature “animated video tracks” accompanying old horror radio dramas. And after that? We’re hoping that Neoflux branches out into other genres. Mixed-media mystery films, perhaps? Check out trailers for Night of the Living Dead: Reanimated below.